Part of the Tresco Estate and the only pub on the island, the New Inn is a godsend for locals and visitors alike. These days, the old stone building has all manner of facilities including a pool and tennis court, as well as charming accommodation, a beer garden with a boules pitch and several options for those seeking sustenance. The daily-changing restaurant menu is strong on seafood - witness grilled John Dory with braised celery hearts and wilted spinach or baked sea bass with flageolet bean cassoulet and basil butter sauce. Alternatively, opt for rack of lamb stuffed with aubergine caviar and round things off with chocolate fudge cake or pistachio and strawberry crème brûlée. Simpler stuff is available in the Driftwood Bar, where the menu covers everything from Cornish pasties and Tresco burgers to grilled Cornish goats' cheese on bruschetta, crispy duck Caesar salad or salmon and smoked haddock fishcakes. 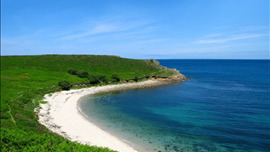 To drink, there are real ales from Scilly Isles' breweries and a choice of around 30 decent international wines.